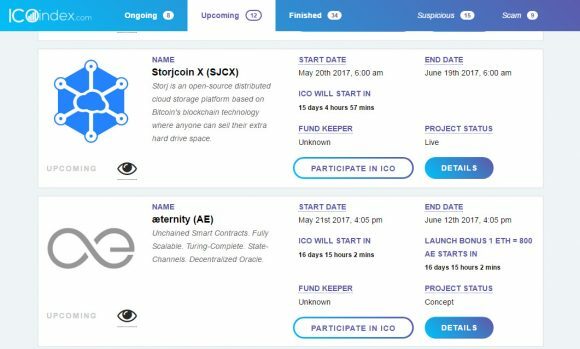 In the world of crypto currencies ICOs (Initial Coin Offerings) are a way for many new startup projects to get funding, the problem however is that there have been quite a few of these in the past that did not end up well. There are still some ICOs that are looking suspicious or are screaming Scam all over the place, so you need to be extra careful should you decide to invest into such a project. Here comes ICOindex, a simple and easy to use platform that enables you to find all ongoing and upcoming ICOs, so you can do your research and decide if you find something interesting or not. The website also tracks suspicious ICOs that you should treat with extra caution as well as ones that are looking like scams and you should avoid wasting your money on. We are not that big fans of ICOs in the crypto world, though we have taken part in some ourselves and will probably continue doing so in the future as well. Doing a proper research and avoiding projects that raise suspicion and have not produced anything yet, but only give you big promises is usually a wise idea. Investing in an initial coin offering may give you satisfaction from being a part of the success of a good project and can also make you some nice profit, but it is also risky form of investment, so be careful not to invest more than you can afford to loose. So a resource such as the ICOindex website might be useful starting point in giving you up do date information and some pointers, but you should still do your own analysis as well.